Well, the Songster has 5 more pages and two more songs. 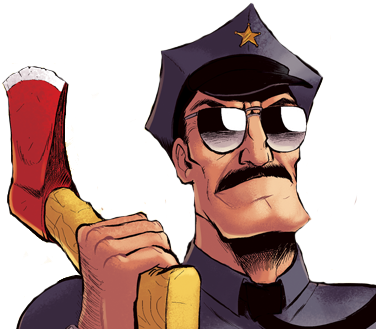 After that, I don’t have plans for more Axe Cop material. I hate to just leave the character sitting around to collect dust. I would like to explore ideas outside of comics, especially a crowd-funded video game. In a couple weeks I will have a new son, so I’ll be taking a small break from work for a month or so anyway. Then I’ll decide what to do next. I would love your ideas. The sick bug got me, so as soon as I post this I’m laying back down. Thanks for reading, and thanks to Parry for getting this song done. I think it’s my favorite one so far. You can listen to the complete version of the song here.